Polleur owes its name to the river which crosses it: the Hoëgne, formerly known as the Polleur. The form Poleda was mentioned in 898. Polleur was included in the domain of Theux which King Zwentibold gave to the bishop of Liège in 898 and shared the life of the district of Theux until the end of the Ancien Régime. Charles the Bold, who devastated the Marquisate of Franchimont, stayed for five or six days at Polleur. From 1610 to 1620, plague decimated the village. In 1676, a fire destroyed 27 houses. During the Liège Revolution, representatives of the five districts of the marquisate met from 26 August 1789 to 23 January 1791, first at Polleur, then at Theux and then at Spa. They held twenty-five meetings which are known as the Congress of Polleur and during them the Franchimont nation proclaimed a Declaration of the Rights of Man and the Citizen (16 September 1789) which was more radical than that adopted at the time by France. The congress members reproached the Liège people for their half-heartedness: they demanded and obtained entry for representatives of the country areas to the Third Estate. In year IV (1795), Polleur was separated from Theux and established as an autonomous municipality. 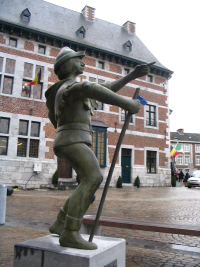 The seigniory of Jehanster, located within the municipality, came under the feudal court of Liège; Thierry de Moylant took it over in 1372. It had many owners thereafter. On 26 March 1705 it was passed to Henri Thomas de Goer of Herve and remained in that family until the Revolution. Polleur had a chapel from at least 1450. It was established as an additional parish church in 1803. Jehanster church became a parish church in 1835. Polleur bridge, rebuilt in 1767, is the subject of an ancient local custom: it is there that a folk court sits and sentences the Cuckoo (that is to say, the last man married in the year) to be thrown into the river. Several iron smelting furnaces existed from the 15th century, but they suffered greatly from the rage of Charles the Bold who "burnt all the houses and broke up all the iron mills in the country which was the main way of living which they (the inhabitants) had." In the first half of the 16th century, work was carried out to rebuild the furnaces but they disappeared during the following century. A foundry was set up in 1587. In the 18th century, the development of the textile industry partly replaced the declining metalworking industry. Some fulling and spinning mills were established along the Hoëgne. While devoting part of the year to agriculture, the people of Polleur worked with wool at home. In the 19th and 20th centuries, there are no major industries to report. Polleur is first and foremost a rural municipality which lives from grazing crops. Currently, there are about fifty farms. However, an intensive house-building policy has given the municipality a residential character. From 1930 to 1976, its population rose from 1308 to 2751. The Verviers-Prüm motorway (A 27) passes through Polleur. Now, the valley of the Hoëgne is overlooked by an impressive viaduct 464 metres long in total.